Freezing tomatoes is the simplest way to process and preserve them. Here’s how to freeze tomatoes in 4 easy steps. 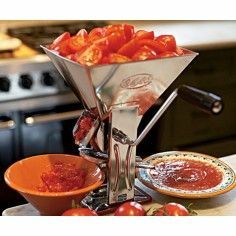 The easiest way to prepare tomatoes for the freezer is to use a tomato press. You'll save time and work, eliminate chopping, and reduce waste. Hold tomato half over the sink. With your fingers or a spoon, scoop out seeds and juice. Set tomato half in a colander over a bowl or pot to drain while you de-seed the rest of the fruit. Save the tomato juice to can or freeze later. To prepare pureed tomatoes: chop in the food processor on intermittent. 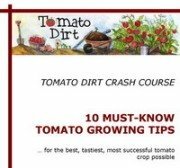 Avoid processing on high, which adds air to tomatoes and makes them foam. You can also freeze tomatoes whole. Freezing tomatoes raw saves time, but most people agree that frozen tomatoes keep more of their flavor when they’re cooked before packing. Place prepared tomatoes in a large cooking pot. Cover and cook until tender, about 10 to 20 minutes. Place pan containing tomatoes in cold water to cool. Leave 1” headspace in plastic freezer containers. Allow space in freezer bags; remove excess air from bags before sealing. Label containers and place in the freezer.